Exeter-Milligan band students were given a rare introduction to the music and instruments of India Tuesday morning. Straight from India, Sandip Burman, brought his sitar, a 20-stringed guitar, and two of his large set of tabla. Not only did Burman play his instruments for the band members, the artist explained how music crosses cultures, often sharing a few words in Spanish to illustrate his point. He taught the group the Indian musical equivalent of the note scale and showed them how he tunes his sitar and the tabla (drums). Prior to the performance, Burman spent a great deal of time alone in the band room carefully tuning his instruments. His tour manager, John Gardner, spoke to the waiting students about the experience they were about to have. He explained how Burman would be playing classical music, but not what they are used to. Gardener gave a brief lecture on how western classical music is several hundred years old while eastern classical music, of which Burman is a master, is between three and four thousand years old. "This music is primarily passed on by word of mouth. Most learn by sitting at the foot of a master," said Gardener. 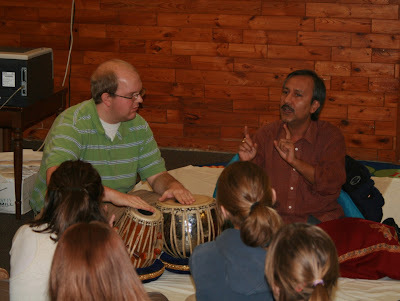 Burman began his 2010 U. S. tour with the stop in Exeter and will visit 15 more schools in Nebraska, Kansas and Oklahoma before returning to India mid-January. If you visit his website, www.sandipburman.com you can see the many places that this renowned world artist has performed. Band Instructor, Shane Whitford, experienced Burman performing while he was in college, and felt like the cultural exposure was more than worthwhile for the students. "Sandip's tour company called me initially and asked if we were interested. Had I never heard of him I probably would have said no, but I remembered his performance when I was at Peru State College. I immediately felt that this would be an excellent cultural experience for the students. Personally, I have been a fan of Indian music ever since Sandip's performance at Peru. I hope that some of the students here at Exeter-Milligan will learn to appreciate it as well." Burman started his lecture with a request for Whitford to sit with him and experience both the sitar and the tabla. Whitford got a lesson in playing the tabla with the audience helping keep the time and clapping with Sandip's instruction. "The best part of the experience for myself and the students was how close we got to sit to the performance. To be able to see the sitar and tabla drums up close is rare treat. So many times you go to concerts and you sit so far away from the performer that you can only hear the music and not see how it is made. We were able to sit right in front of Sandip and see exactly how he plays the instruments," said Whitford. The event was sponsored in part by the Exeter-Milligan Boosters and the Exeter-Milligan school.